We have been having trouble with cancer lately. Suffice it to say hospice care is the order of the day. Our afflicted loved one is in good spirits, even if not feeling that well. She likes to “tell it like it is” as well as to be told the straight story, without sugar coating. She is generous about talking to other family members regarding her condition to allay fears, even though it is not possible to reduce the acute sadness that we are all experiencing, each in our own way. She fielded the question, “Are you afraid?”. She said that she wasn’t. She said that, if she had her druthers, she would rather not be in her current state of health, but reiterated that she wasn’t afraid. My mother said the same thing when I asked her if she was afraid of dying. I don’t think that I will be afraid either, but it is an abstract idea, not an imminent possibility. I can easily imagine losing my cool and panicking if I know I am facing certain death. Below is a schematic representation of someone facing the unknown. It is a cool, emotionless statement that does not come close to plumbing the depths of emotion involved with the end of life. I am sure that art history is rife with examples of pictorial renditions of the emotions involved with death. I keep those emotions at arm’s length. I don’t want to think of them, no less commit visual ideas to paper at the moment. 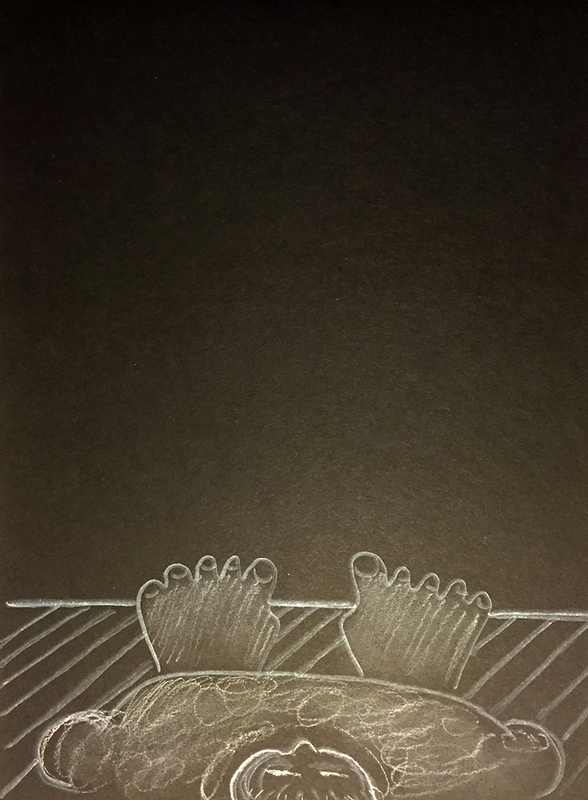 This entry was posted in Personal Stories and tagged artistic process, cancer, death, dying, end of life, family dynamics, fear of death, hospice, schematic representation, visual arts. Bookmark the permalink. I can relate, thoughts are what gives you hope. Thank you Elisabet. It will be a sad adventure. Sending thoughts and prayers for you and your loved one. Thank you very much Dr. V. You must have had more than your share of this side of life, knowing the whole process of dying, and seeing patients in all stages there of. My father said the same after being diagnosed with cancer, and knowing there would be no second chance for him. Also: “no regrets”. I hope to face death with the same attitude and dignity. Thank you so much, Kerfe. I know what you mean. That is under the definition of having had a well-lived and brave life.